Last week, it finally started to snow. 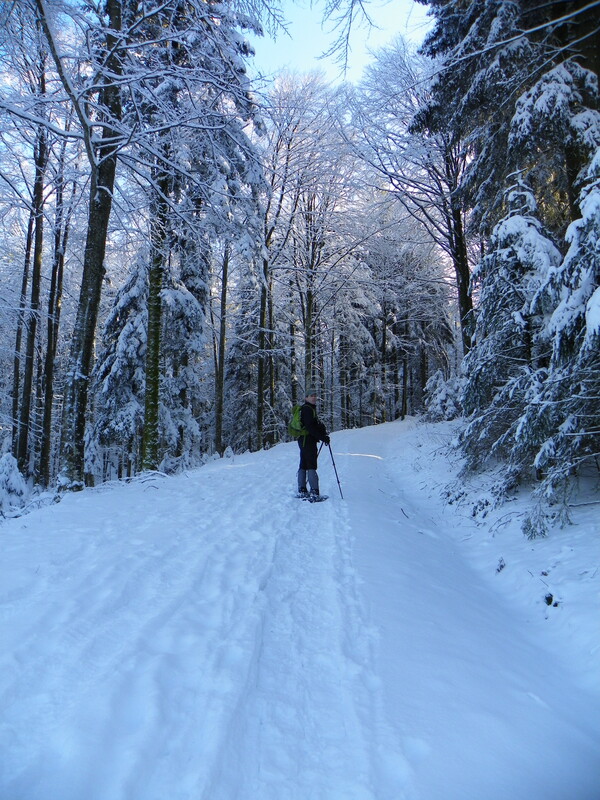 So, after a draining week, my husband and I decided to let off some steam the best way we know how: snowshoeing. 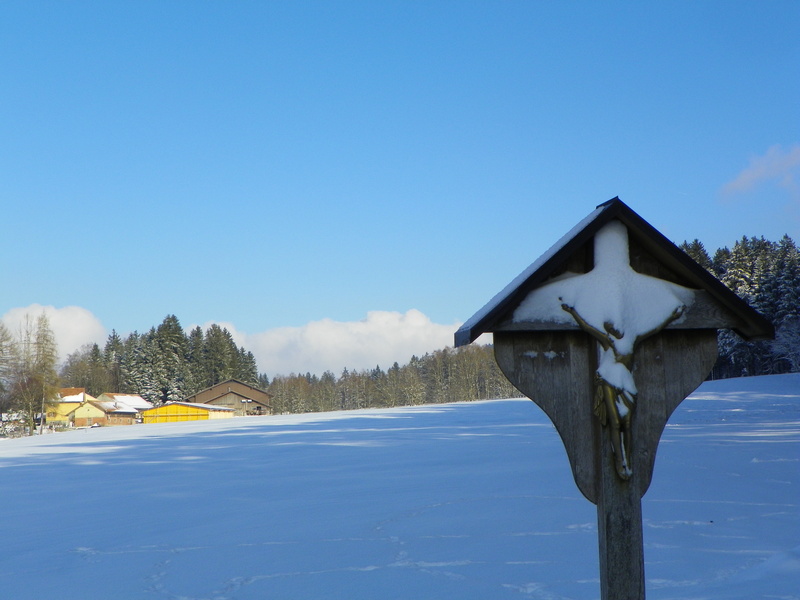 It was a glorious, blue-sky day and so we headed to my favorite neck of the woods: the Toggenburg region of St. Gallen canton. 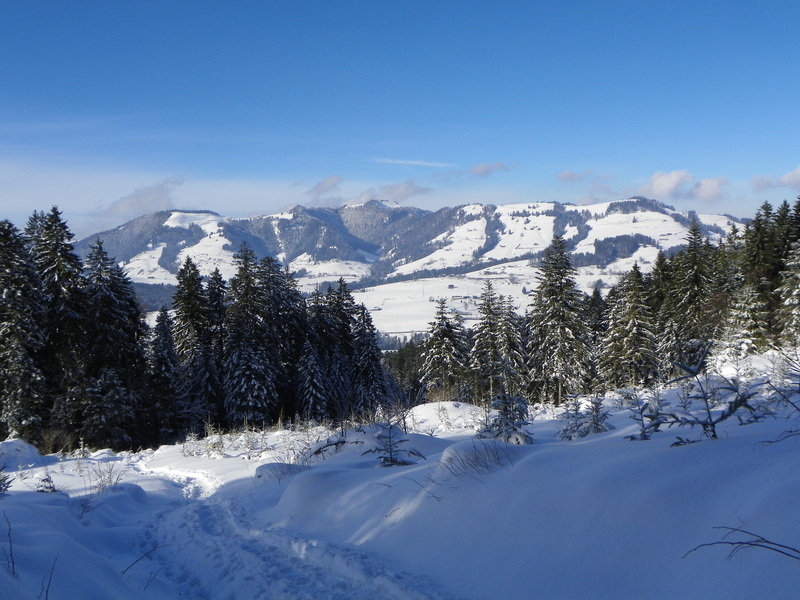 This time we decided to try the nice flat moor area near Ricken, half way between Herisau in Canton Appenzell and Uznach in Canton St. Gallen, well that was my plan. 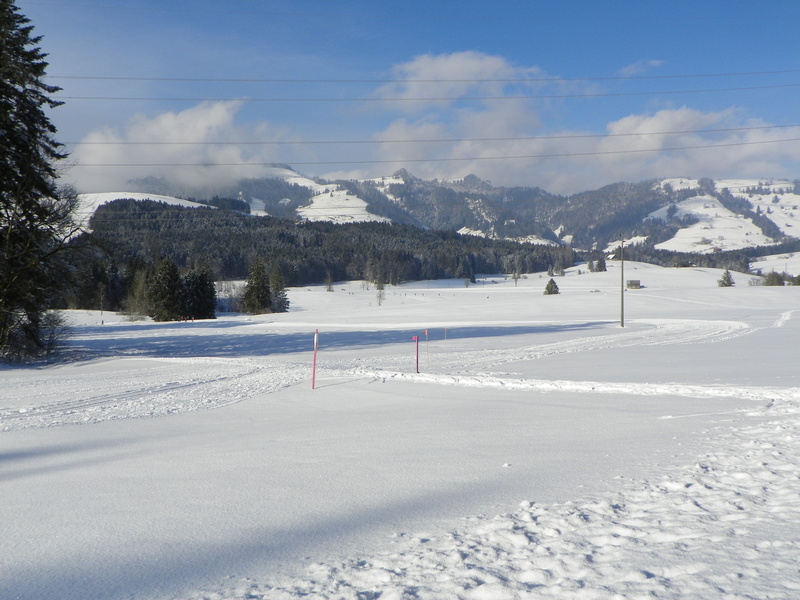 See all this nice, flat area for cross country skiing…. Cross Country Skiier enjoying a nice comfortable ride. Of course, with me busy trying to get all my gear together, I let Countryboy find a route, giving him some guidelines for where to look. My idea was for us to split up and let each of us do our own thing. Of course when we arrived I was so mesmerized by all the gorgeous snow that I just forgot about my plan to go solo. View from the parking lot, where we started our tour. After suiting up with all our gear and trekking a bit up the first stretch of track, we were able to finally get our snowshoes strapped on, and help some older lady put on hers. By that time it was almost lunch time and my breakfast was wearing off. 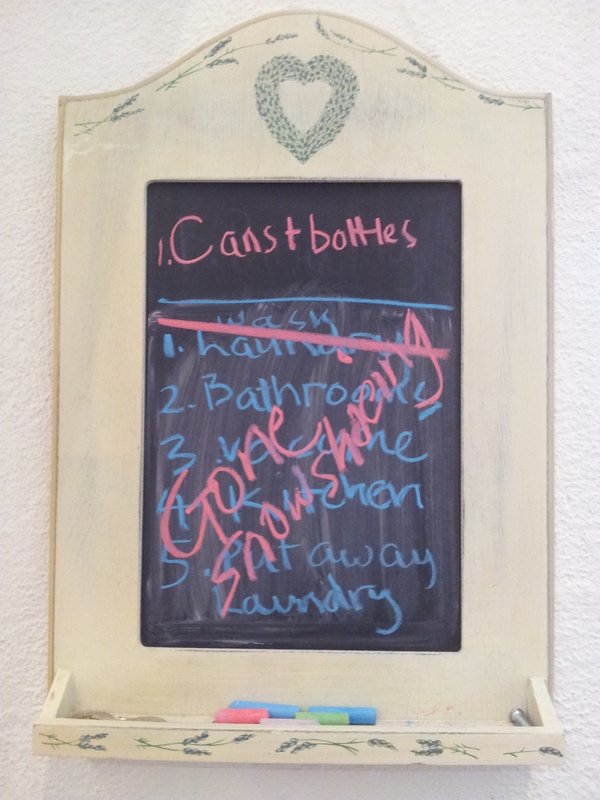 An hour later was about all I could take before the alarm bells started to ring. Countrygirl was hungry and she wanted food now. And not just the emergency rations of granola, chocolate and TUC crackers that were devoured without a second thought, but something warm and hearty! Unfortunately, the nearest mountain hut restaurant was another 45 minute hike. 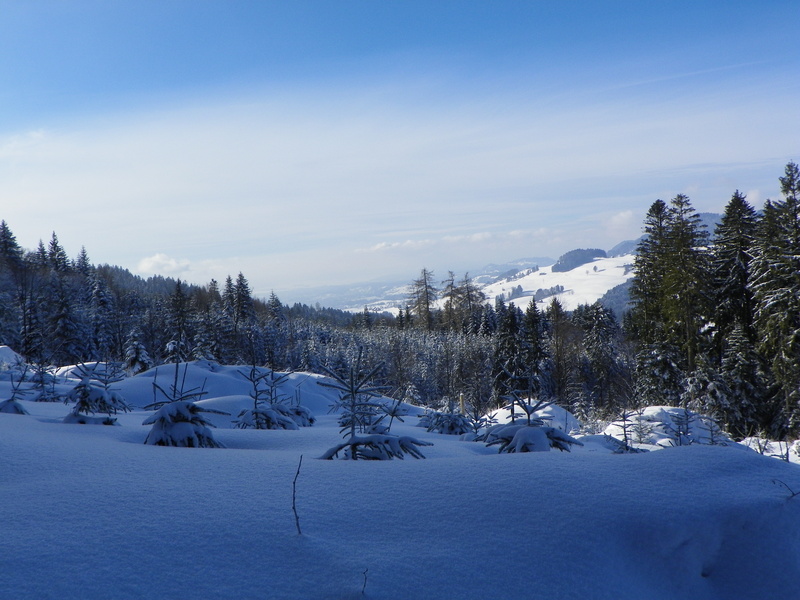 So after enjoying the view of rolling snow covered hills and the view down onto Lake Zurich, we decided to turn back. 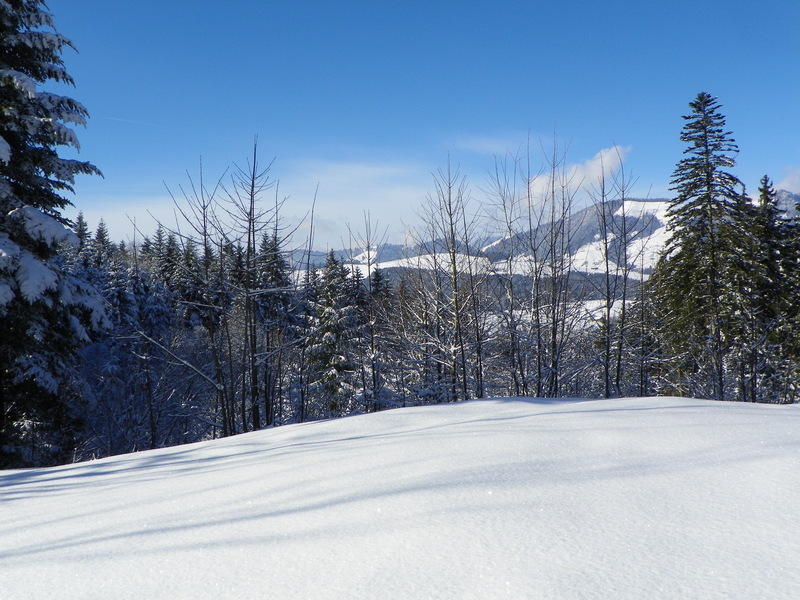 Today, we would not see any stunning mountain views… we would not have a delicious bowl of ‘Gerstensuppe’ (Barley and vegetable soup) or a hearty portion of something cheesy. No, there would be none of that, nor the sledding adventure Yves had planned. It would have been a first for me, but you cannot talk any reason into a starving Countrygirl. In my defense I would like to blame it on the lack of a hearty breakfast. You see when you go snowshoeing you burn energy fast!! 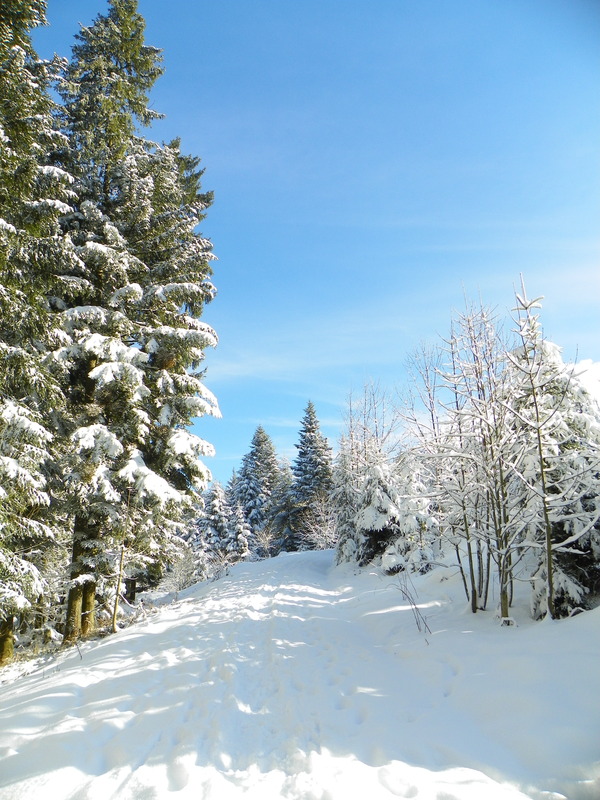 You burn twice the amount of calories as with merely walking in snow. You have heavy boots on, you use your upper arms and not just your feet, as you have to hold poles and then of course you have the nasty Tour Difficulty scale that has nothing to do with reality. 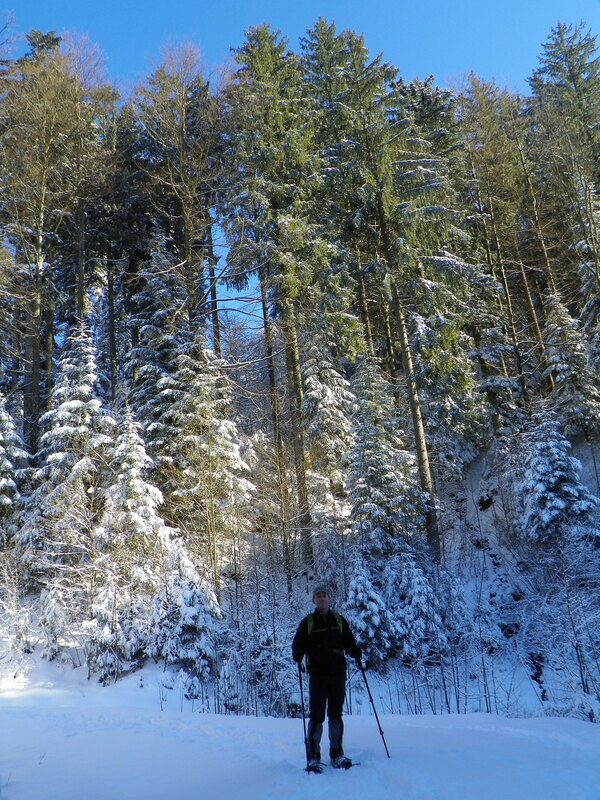 Apparently, the Swiss Alpine Club, only considers a snowshoe tour difficult if you put yourself in bodily danger, i.e. 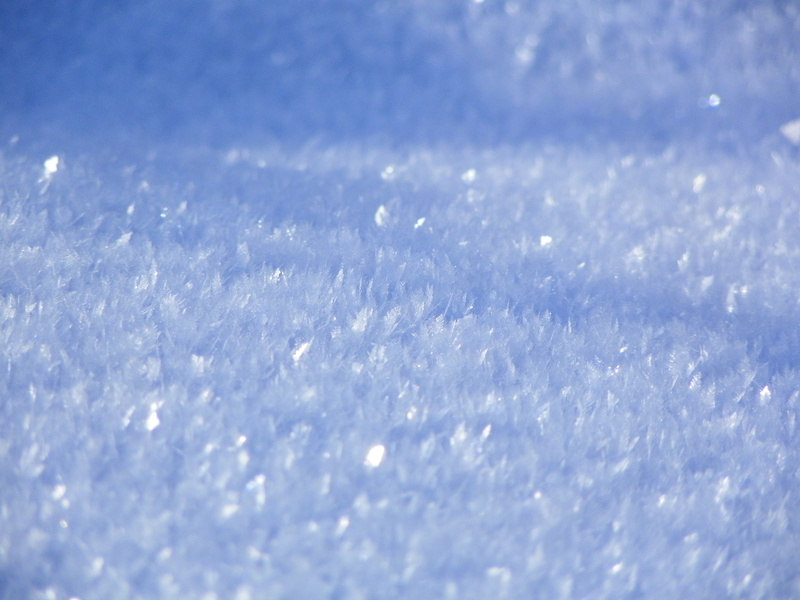 if you are falling off a cliff or are going in an Avalanche area, see link here . We’ve done both of those, but nevertheless, I would not have called this a W1 level hike. I mean surely, that last part is steeper than 25 degrees?! Anyway, how can you judge the difficulty without judging the weather and or snow conditions? Sure I’ve done worse, a lot worse, but that hill was a killer. In any case my body will tell you this was not an easy route, it was a safe route maybe, but not an easy one. 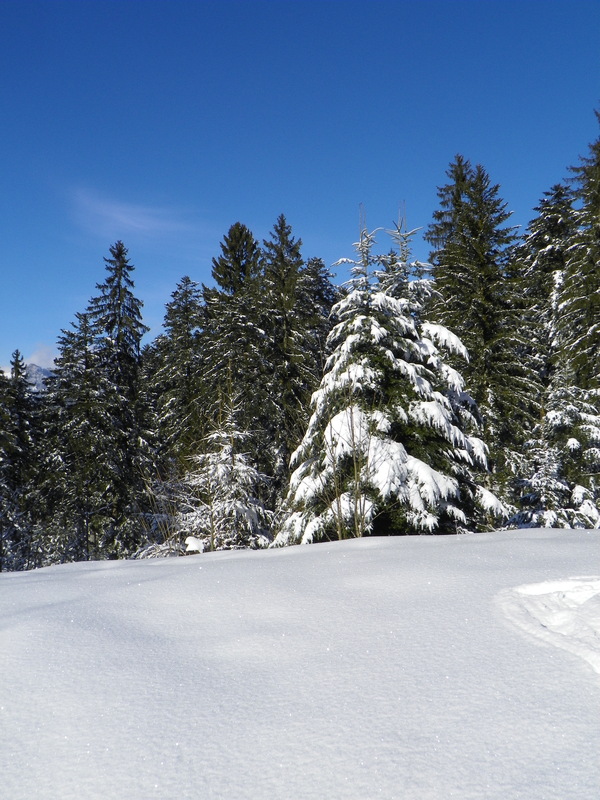 Snowshoeing is simply not a walk in the park, you need to be prepared. 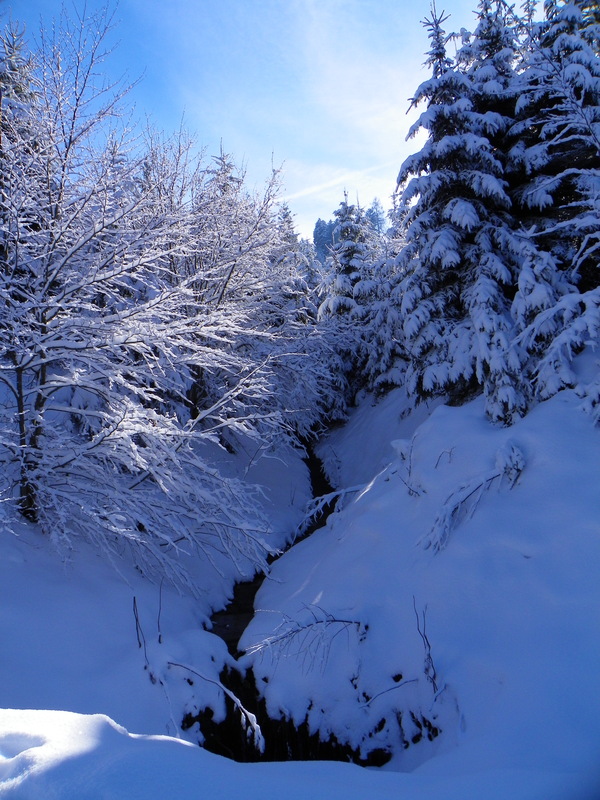 So enough ranting for the day, I hope I’ve wet your appetite for a snowy snowshoeing season here in Switzerland. 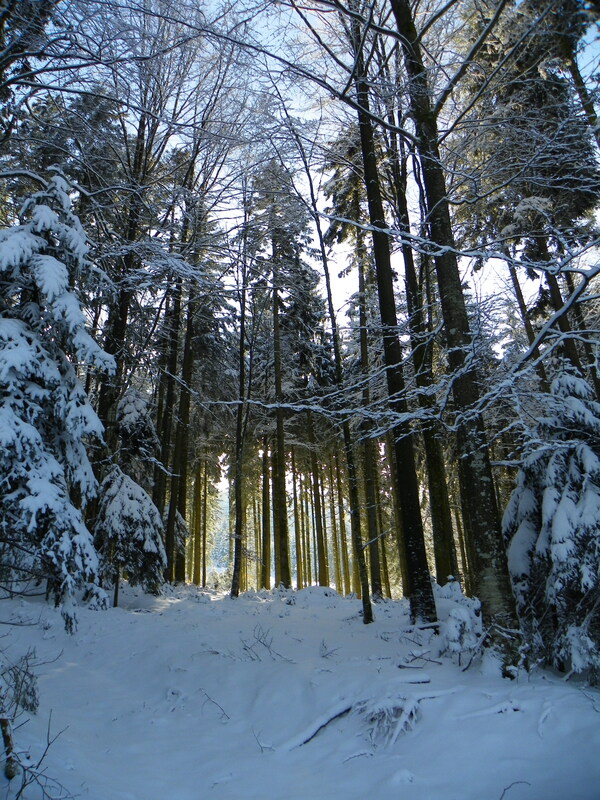 If you would like to see the details of the route or Countryboy’s version of our tour and his photos, please see Countryboy’s log/blog at hikr.org and his version of this snowshoeing tour here. Please note that although his report is in German, you can navigate the site in English. 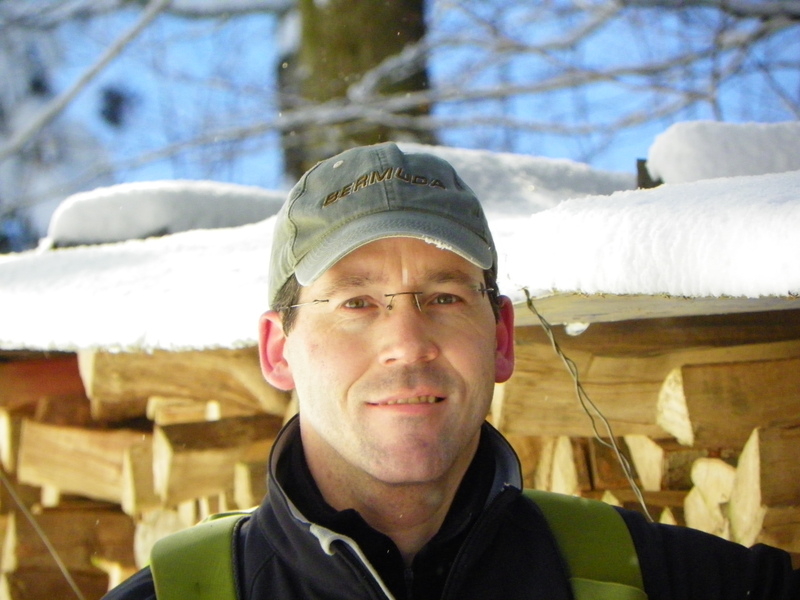 My overly ambitious snowshoer: known as Countryboy on hikr.org, where he logs his hiking and snowshoe tours. 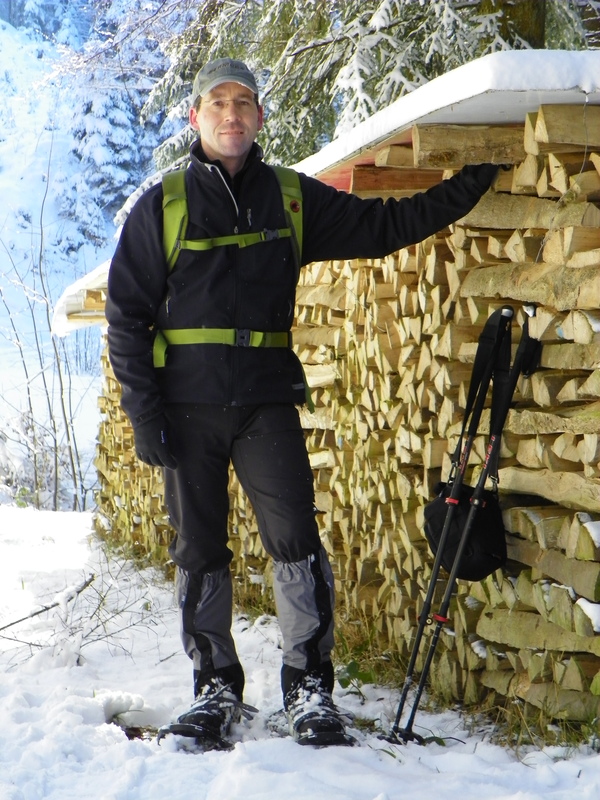 Should you have any comments or thoughts you would like to share with me, about snowshoeing or any other topic I would love to hear from you. Wishing you a very snowy Monday, or at the very least dreams of one! Haha the dreams of one is right! The pics are beautiful! Countryboy’s are too! I love the tops of the trees sticking out! Xoxoxo looks like tough work Jodie! I’ll stick to going down the mountain! But I’d try it if we came out there! 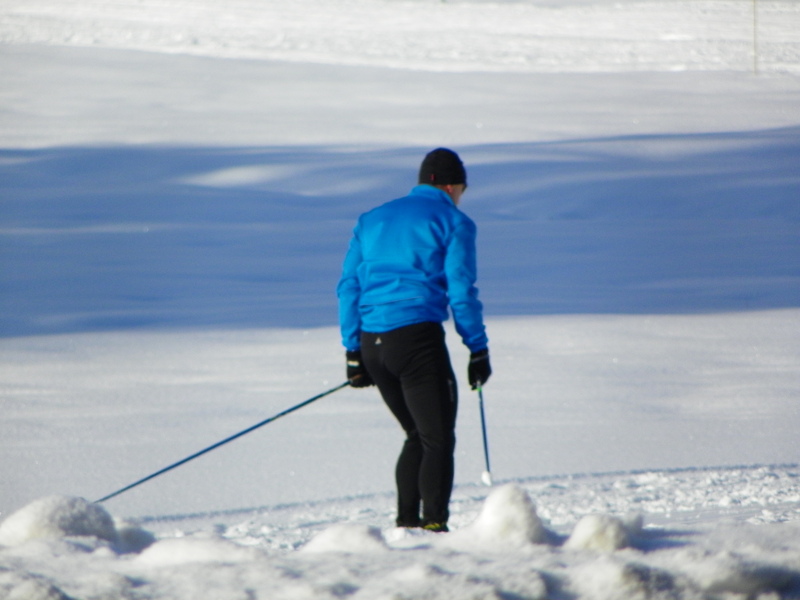 I liked cross country skiing too. The views are amazing! Hey, remember I picked the location, Yves picked that route! Don’t worry I’m working on another post to relieve all your concerns. I promise you, you will love it. Maybe not as much as sizzing down the Jakobshorn with your camera while Snowboarding!!!!! But you willl love it!! It is very theraputic. I mean hey half way through it I was wishing I could have a divorce and at the end it was like we were on our Honeymoon!! No this one wasn’t that bad, it was just the lack of food in the stomach that made it a CHALLENGE!! I wish we had some snow! Not much to speak of down here in Geneva (read none locally). Not that I’d willingly go OUT, mind you. I’d much rather quilt but I’m sure that Mr P (aka Mountain Biking Lunatic) would drag me out anyway and I’d find I love it. I’d definitely be in for something cheesy to eat though! I know your blog well. Wanted to take classes with you ages ago and am still keeping an eye on your retreats. But Geneva is practically on the other side of Switzerland. There are some upcoming events though in your neck of the woods that might get me there. But lately I too am more into staying in, cooking and quilting as the weather has been so awful. When it is lovely I feel obliged to go out!! And eventually those feelings of obligation push me further than my SG village. Oh the Swiss, they love to play hard huh? Ok I don’t know if your Mr P is Swiss or just a newbie. But if I remember you’ve been living here a while. Thanks so much for stopping in! It is nice to hear from other quilters who are not so far away!!!! !